Custom CMS Development Services | W3care Technologies Pvt. Ltd. It is a monitoring system that allows the admin with the rights to manage content which maybe in the form of text, embedded graphics, photos, video, audio, and code (e.g. for applications). It is used to create, manage, store and deploy content on website pages. CMS even allows the administrator to manage the content of the website during runtime. The content can be in the form of text, images, products, videos etc. in different languages. The content management system facilitates you with ability to manage your website or a part of it on your own or with the help of your stakeholder. This finally tags for a smart decision of CMS development services and onetime investment for the production of a functional website and modify it as and when needed. W3care is specialized in user-friendly and powerful custom CMS development services to help you manage the entire workflow of your organization/business. ExpressionEngine Development: ExpressionEngine was paid CMS since beginning but in November, 2018, a new version of ExpressionEngine 5 was launched as free open source software. EE provides the free hand for the development and enable you to make your site unique. We have expert team of experienced ExpressionEngine developers for best EE development. We have more than 10 years experience in ExpressionEngine and deployed hundreds of website. Joomla Development Services: Joomla is also free open source software which has features to enable development of any web application. It is a multipurpose open source software, content management and ecommerce solutions. It was initially released in 2005 and built on model view controller web application framework. We are well recognized for Joomla web development services since 2010. Contact us today for Joomla development services. WordPress Development Services: WordPress is also FOSS (Free Open Source Software) as a most popular blogging and web development tool. It is a CMS based on PHP and MySQL. It has vast collection of themes and plugins to enhance the website & also save time. It was initially released in 2003. We provide WordPress website development Services at reliable cost by experienced development team. Magento Web Development Services: Magento is one of the most popular CMS for ecommerce platform development. It was released in 2008 as first generally available. It provides flexibility, scalability and other features for the sustainability of business. It has three popular editions and these are as Magento Go, Magento Enterprise, Magento Community. Contact us today and share your requirements for Magento ecommerce development services. Craft CMS Development: Craft is the CMS which makes everyone happy. It gives free hand for fully custom content modeling, control over HTML and robust support. It has an intuitive control panel. You can see live changes while typing. It has many more features which will make you fan of it. Contact us today and share you requirement of Craft CMS development services. We develop and integrate top-of-the-line Content Management Systems. Working on the popular ‘What You See Is What You Get’ model, our CMS enable you to update the web presence in the most user-friendly manner. We have been CMS website development services since 2010 and have developed hundreds of websites. Our teams are also expertise in custom CMS development Services . We have a long list of satisfied clients throughout the worldwide countries. You can get in touch with us to share your business needs and we will sure suggest an optimal solution for you! We are process-driven company and solely focus on client’s satisfaction. We tend to work with passion, transparency, determination, persistence, and technical ability to meet your goal.We work on all major content management systems and have deployed CMS projects successfully to clients.Our goal is to accomplish project consistent with agile method model with quality assurance.Our all websites area unit SEO optimized. We have conjointly allotted team to maintenance and dedicated support. 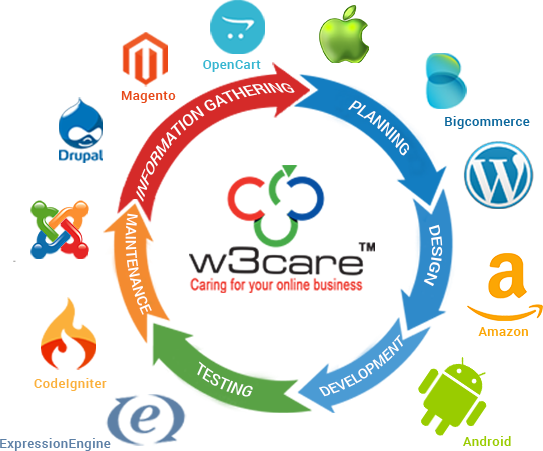 W3Care has provided enormous expertise and value on several web development projects. Their creative thinking and engineering expertise has allowed us to innovate our product offering. Their detail oriented approach to project management and high-level communication ability, makes working with them a win-win experience for everyone involved.